When are they in season? I haven’t the foggiest clue. It used to be that they were abundant from November to March, and I thought that was the peak of the season when I wrote this earlier post, here. Then for a couple of years, last year in particular, there was a dearth of pomelos around at that time. And supplies are erratic, of poor quality and often outrageously expensive. My Doreen Fernandez book on Fruits of the Philippines states that pomelo is available from November to January. But on a trip to Bicol in March one year, I spotted a few fruit on a tree, barely halfway to maturity… could it be they now fruit year round? Perhaps readers from Mindanao can enlighten us… A good pomelo is definitely one of my favorite tropical fruits. Juicy, sweet and yet with a hint of bitterness, it is excellent when eaten peeled and chilled. Also terrific in a spicy Thai style salad. And somewhat a surprise, a friend’s family serves the sweetest pomelo with some fried bagoong alamang on the side, and it is a perfect match! So I am ALWAYS on the lookout for good and reasonably priced pomelos… and last week, in Cebu, we hit the jackpot. Victor, my Carbon specialist in Cebu, informed me on my arrival in the city, that pomelos were aplenty… so a quick trip to the Carbon yielded 20 kilos of fruit for just PHP460, or PHP23 a kilo! The same fruit in Manila was retailing for well above PHP100 a kilo! Good morning on a stormy morning! I love pomelos but I am not so lucky to buy the sweet ones that are as soft as rice. I love them in salads. That is a nice pink you got in your pomelo shake. I wish I was your neighbor! Hi Marketman – Here in Davao, where I live, Pomelo (Suha or Buongon) is available 12 months of the year. Cheap too! Usually less than the price that you paid in Cebu, if you know the right places to get it! Didn’t know one could turn pomelo into a shake. Doesn’t sound like an idea good enough to motivate me. If it was really sweet and juicy, it probably wouldnt even make it as far as the blender. Prefer the pink ones over the yellow ones. i actually prefer a bit of the pith/rind in my pomelo shake. just the right amount of sugar and a pinch of salt. makes all the difference. when i went home to iloilo last feb, it was selling for P90 each and the smaller, but jucier ones, were P60..it came from someones’s private farm..
how did you fare during the bad storm,MM?? my home in iloilo, was spared, thank God..the pictures in yahoo and e-newspapers are scary-looking..
natie, the damage to lives and property was horrible, with over 700 still missing from a capsized ferry and prayers goes out to the missing folks and their families this evening. I understand Iloilo was especially hard hit as well. although you get pomelos year round from davao … there are months that the pomelos are slightly dry. Just like any fruit… there are months that the pomelos are on the tart side and sometimes you get the perfect balance of sweetness and tartiness. The philippine pomelo is still better ( my personal opinion) than the thai pomelo which was kinda weird when i first saw it since the pulp is yellow. Hi, MM .. hope all is well with you and your families/loved ones during the torrential storm.. The last time I had it – http://www.ireneeng.com/?p=1322, was more like grapefruit than pomelo, I was disappointed. MM, there’s a candied pomelo rind recipe I saw recently, will dig it up and sent it to you. It’s dressed with chopped up chilli and sugar and salt, very Thai! 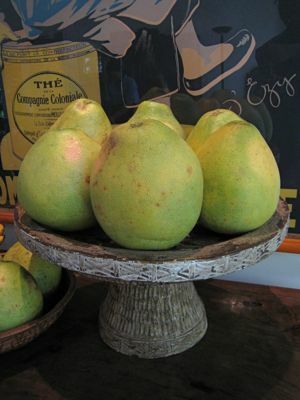 Hi Marketman – There is a season when the Pomelo is at it’s best. Here in Davao, that is around August through December or January. It’s still good throughout the year, but just not quite as good! I was in Davao two weekends ago and was given a box full of suha. We drove around town to buy some more. It retailed for 70-100 per kilo. We found out that the branded suha are not necessarily better than the generic ones. Always ask for a taste test so you don’t get fooled. What I discovered recently is that suha stays fresh and juicy longer if kept in the refrigerator. Wish I’d known that sooner! I was in Puerto Princesa recently and had a fabulous mango-pomelo shake. I still have some late mangoes from an uncle’s farm, your post just motivated me to score some pomelo tonight and whip something up! 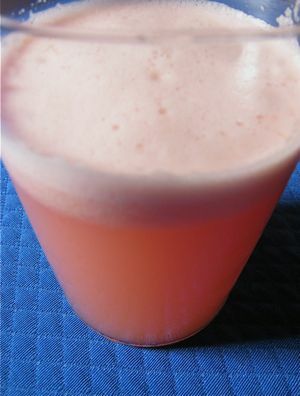 i had pomelo shake in Cibo yesterday..:-) i ordered that having reading this post..and it was good! my mom and my friend didn’t like it though,maasim daw,but I found it quite refreshing..